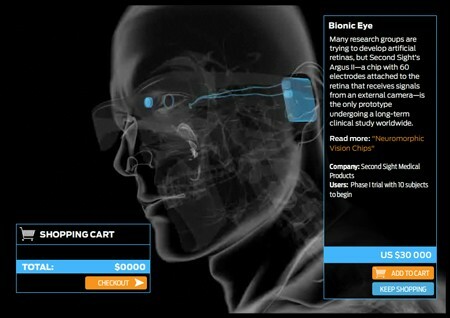 Various cybernetic limb and organ replacements were recently featured in IEEE’s flash demo called The Bionic Body Shop, but we were most interested by the bionic eye and the cochlear implant (we already discussed the featured powered exoskeleton). These are notable for the fact that they are not merely high-tech prosthetic replacements strapped to or worn on the body, but implants that are housed within the body and work with flesh-and-blood sense organs on a much closer level than any preceding technology. Kolotouros Dimitrios liked Coin Cell Powered Temperature/Humidity Display. Christoph has added a new log for IVAR, the hack rack. Squonk42 has added a new log for Keymu - open source keychain-sized gaming console. thekidtonystark wrote a reply on Horizon. Squonk42 has added a new log for Funkey Zero. Matt liked Power Stacker: Stackable Battery System.